"People may be suspicious of Jamaica, but Stephen told us there are two ways, 'You can do it through hard work and beat the athletes on drugs or you can take the drugs.' Stephen does not give his athletes drugs and Jamaicans believe in hard work." -Britain's Germaine Mason, Jamaican-born and raised, on his coach, Stephen Francis. 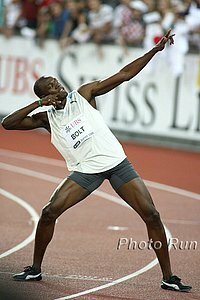 We have heard Carl Lewis, Victor Conte and other sources raise suspicions about Jamaica's astronomical sprinting achievements in 2008. But Mason, the 2008 Olympic silver medal-winning high jumper, trains in the sub-par facilities with Francis and Glen Mills and the Jamaican sprinters and claims it's all talent and hard work ... no drugs involved. Click here to see a NYT article on the evolution of Jamaica's drug testing policy (extremely weak before this year), the testing of Bolt and Powell (each tested over 20 times this year) and a list of famous Jamaican-born sprinters to test positive.